Most of the relays depend upon excess of current on their operation. Such relays are sensitive because they cannot make correct distinction between heavy load conditions and minor fault conditions.In order to overcome this problem differential relay is used. A differential relay is one that operates when the phasor difference of two or more similar electrical quantities exceeds a pre-determined value. Almost any type of relay when connected in a certain way, can be made to operate as differential relay. Most differential protection relay are of current differential relay. It may be noted that any type of relay when connected in a particular way can be made to operate as a differential protection relay. In other words, it is not so much the relay construction as the way the relay is connected in a circuit that makes it a differential relay. There are two fundamental systems of differential or balanced protection. 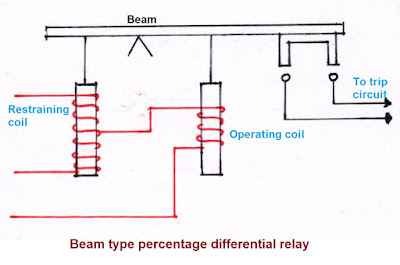 Biased or percentage differential protection relay. 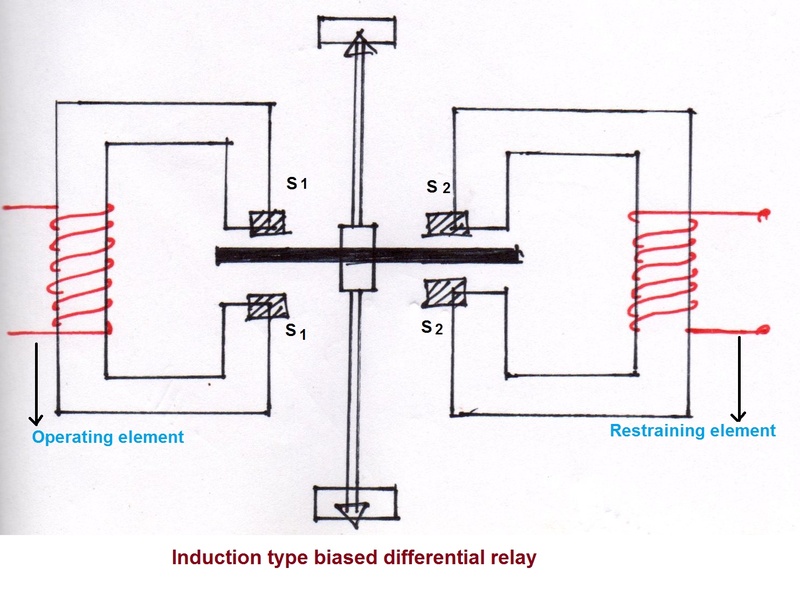 Induction type biased differential relay. Current differential relay is one that compares the current entering a section of the system with the current leaving the section. A pair of identical current transformers are fitted on either end of the section to be protected. The secondaries of current transformers are connected in series in such a way that they carry the induced current in the same direction. The below figure shows the arrangement of an overcurrent relay connected to operate as a differential relay. Under normal operating conditions, suppose the alternator winding carries a normal current of 1000 A. Then the currents in the two secondaries of current transformers are equal. These currents will merely circulate between the two current transformers and no current will flow through the differential relay. Therefore, the relay remains inoperative. If a ground fault occurs on the alternator winding as shown in the figure below, the two secondary currents will not be equal and the current flows through the operating coil of the relay, causing the relay to operate. The amount of current flow through the relay will depend upon the way the fault is being fed. Current differential relay is likely to operate inaccurately with external faults since the supposedly identical current transformers may not have identical secondary currents due to constructional errors or under severe fault conditions. Current transformers may saturate and cause unequal secondary currents and the difference of the secondary currents may approach the pick up value of the relay. This disadvantage is overcome in the percentage differential relay. 1. The impedance of the pilot cables generally causes a slight difference between the current at the two ends of the section to be protected. 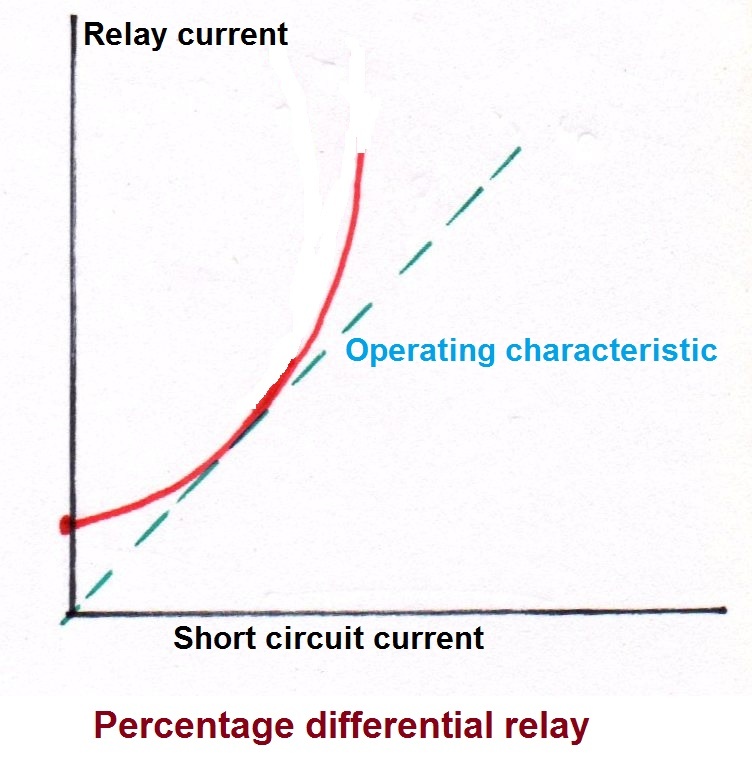 If the relay is very sensitive, then the small differential current flowing through the relay may cause it to operate even under no fault conditions. 2. Pilot cable capacitance causes incorrect operation of the relay when a large through current flows. 3. Accurate matching of current transformers cannot be achieved due to pilot circuit impedance. In voltage balance differential relay, two identical current transformers are connected at either end of the element to be protected by means of pilot wires. The secondaries of current transformers are connected in series with a relay in such a way that under normal conditions, their induced e.m.f's are in opposition. Under healthy conditions, equal currents will flow in primary windings of both the transformers. Therefore, the secondary voltages of the two transformers are balanced against each other and no current will flow through the relay operating coil. When a fault occurs in the protected zone, the currents in the two primaries will differ from one another and their secondary voltages will no longer be in balance. This voltage difference will cause a current to flow through the operating coil of the relay which closes the trip circuit. A multi-gap transformer construction is required to achieve the accurate balance between current transformer pairs. The system is suitable for protection of cables of relatively short lengths due to the capacitance of pilot wires. On long cables, the charging current may be sufficient to operate the relay even if a perfect balance of current transformers is attained. The biased beam relay is designed to respond to the differential current in terms of its fractional relation to the current flowing through the protected section. It is also known as percentage differential relay because the operating current required to trip can be expressed as a percentage of load current. 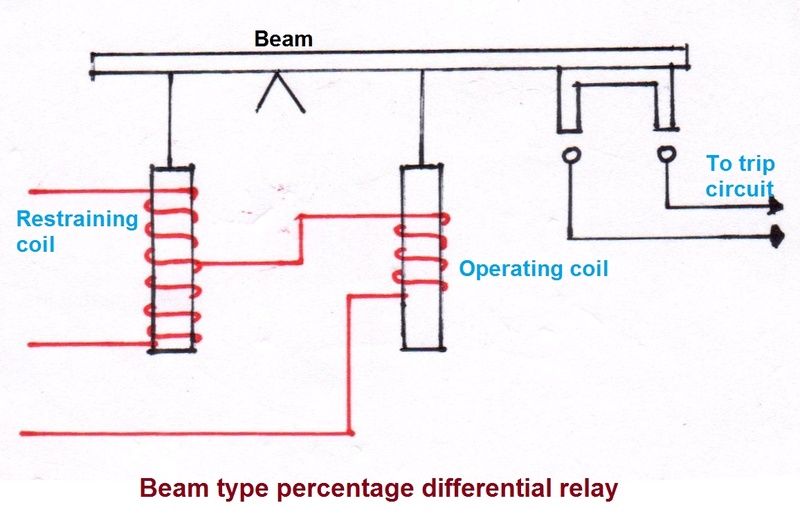 Disadvantages in current differential relay can be overcome by biased beam relay. It is essentially an overcurrent balanced beam relay type with an additional restraining coil. The restraining coil produces a pull preventing the contacts from closing, while the operating coil produces a pull in the opposite direction. Under normal and load conditions, the bias force due to restraining coil is greater than the operating force. Therefore, the relay remains inoperative. When an internal fault occurs, the operating force exceeds the bias force. Consequently, the trip contacts are closed to open the circuit breaker. The bias force can be adjusted by varying the number of turns on the restraining coil. The greater the current flowing through the restraining coil, the higher the value of current required in the operating winding to trip the relay. Thus under a heavy load, a greater differential current through the relay operating coil is required for operation than under light load conditions. Since this relay has rising operating characteristic i.e. the pick up value increases as the magnitude of current increases, the relay is restrained or biased against operating inaccurately. Due to this reason it is called biased relay. Instead of the slope of the characteristic remaining constant, it may increase as the short circuit current increases. The characteristic curve is shown in the figure below. 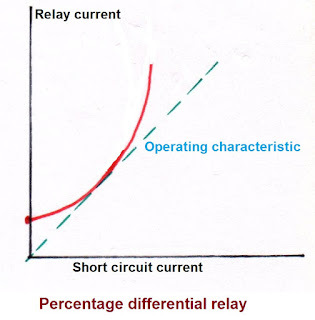 Accordingly the relays are referred as constant differential relay and increasing differential relay of the percentage differential biased relay. Difference between them is that increasing slope type requires less accuracy and cost high than the constant slope type. Percentage differential relay system is also called as Merz price protection relay system. It is the most common type of protection used for stator windings against phase-to-phase or phase-to-ground faults. It is recommended for protection of generators rated 1 MVA or higher, and most of such generators are protected by differential relays. For generators rating above 10MVA is almost universally the practice to use differential relays. Percentage differential relaying is used, protecting about 80% of the stator winding. Induction type biased differential relay consists of pivoted disc D free to rotate in the airgap of two electromagnets, a portion of each pole of which is fitted with a copper shading ring. This ring can be moved into, or out of the pole. Two torques are exerted on the disc, one torque due to the operating element and the other due to the restraining element. If the shading rings are were in the same portion on operating and restraining element, the resulting torque exerted on the disc would be zero, but if the shading ring S2 were moved further into the iron core, the torque exerted by the restraining element will be greater than that of the operating element. 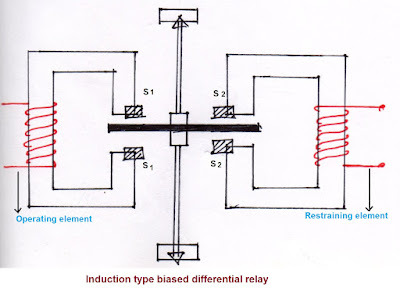 Induction type biased differential relay is not susceptible to operation due to transients, a slight time delay can be obtained and the biasing feature can be finally adjusted merely by altering the position of the shading rings on either or both elements.